The name “Cebu” came from the old Cebuano word sibu or sibo (“trade”), a shortened form of sinibuayng hingpit (“the place for trading”). It was originally applied to the harbors of the town of Sugbo, the ancient name for Cebu City. Alternate renditions of the name by traders between the 13th to 16th centuries include Sebu, Sibuy, Zubu, or Zebu, among others. The arrival of Portuguese explorer Ferdinand Magellan in 1521 established a period of Spanish exploration and colonization. Losing favor for his plan of reaching the Spice Islands from king Manuel I of Portugal, by sailing west from Europe, Magellan offered his services to king Charles I of Spain (Charles V, Holy Roman Emperor). On 20 September 1519, Magellan led five ships with a crew of 250 people from the Spanish fort of Sanlucar de Barrameda en route to southeast Asia via the Americas and Pacific Ocean. 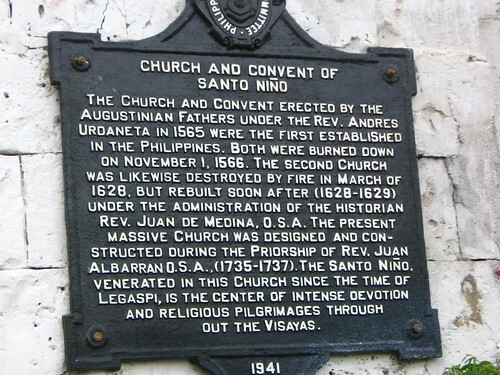 They reached the Philippines on 16 March 1521. Rajah Kolambu the king of Mazaua told them to sail for Cebu, where they could trade and have provisions. Arriving in Cebu City, Magellan, with Enrique of Malacca as translator, befriended Rajah Humabon the Rajah or King of Cebu and persuaded the natives of allegiance to Charles I of Spain. Humabon and his wife were given Christian names and baptized as Carlos and Juana. 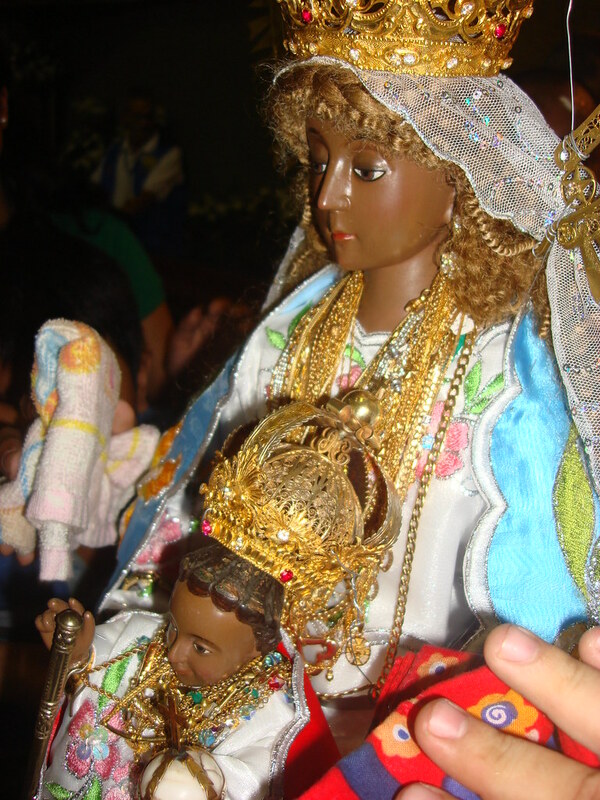 The Santo Niño was presented to the native queen of Cebu, as a symbol of peace and friendship between the Spaniards and the Cebuanos. 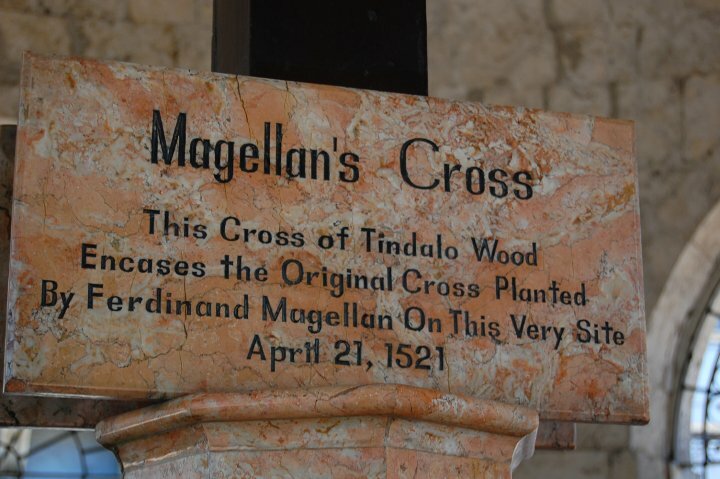 On 14 April Magellan erected a large wooden cross on the shores of Cebu. Afterwards, about 700 islanders were baptized. Magellan soon heard of datu Lapu-Lapu, a native king in nearbyMactan Island, a rival of the Rajahs of Cebu. It was thought that Humabon and Lapu–Lapu had been fighting for control of the flourishing trade in the area. On 27 April the Battle of Mactan occurred where the Spaniards were defeated and Magellan killed by the natives of Mactan in Mactan Island. According to Italian historian and chronicler, Antonio Pigafetta, Magellan’s body was never recovered despite efforts to trade for it with spice and jewels. Magellan’s second-in-command, Juan Sebastian Elcano took his place as captain of the expedition and sailed their fleet back to Spain, circumnavigating the world. One of the most iconic attractions to see in Cebu is the cross of Magellan. Ferdinand Magellan was the first European to come to the Philippines in 1521. The explorer Magellan planted a cross to signify this important event about the propagation of the Roman Catholic faith in what is now Cebu, in central Philippines. The original cross is reputedly encased in another wooden cross for protection, as people started chipping it away in the belief that it had miraculous healing powers. Southern Cebu is a paradise loaded with beautiful waterfalls. One of the most popular is the Tumalog Falls in Oslob. Words can’t describe the beauty so it is best of you find a way to see it for yourself. Cebu’s holiest church houses a revered statuette of the Christ child (Santo Niño) that dates all the way back to Magellan’s time. This church is one of the top sites to see on every travelers list. The Taoist Temple in Cebu is a famous tourist attraction. The temple was built in 1972 by the Chinese community and has been a must-see attraction ever since. One of the most popular photo opportunities in all the Philippines is the statue of Lapu Lapu. 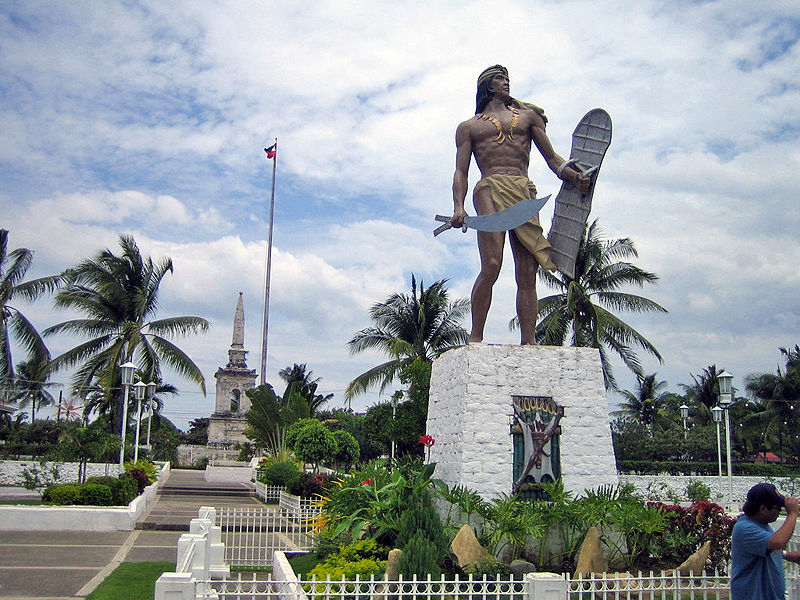 erected in honor of Lapu-Lapu, a native leader who defeated Spanish soldiers led by the Portuguese explorer Ferdinand Magellan in the 1521 Battle of Mactan. 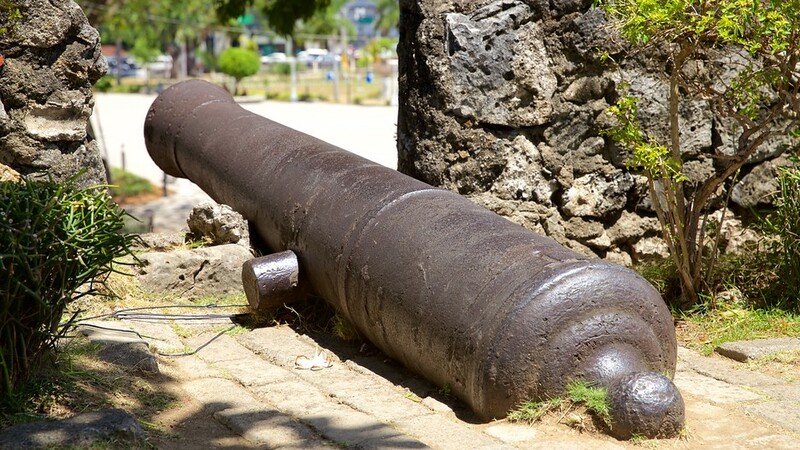 Visit Fort San Pedro or Fuerza de San Pedro to have a glimpse of Cebu’s rich history. The work on the fort was first started on May 8, 1565 by Spanish and indigenous Cebuanos under the command of Miguel López de Legazpi. Fort San Pedro is located in Plaza Indepedencia in the pier area of Cebu City. With an entrance fee of only P30, you can already tour inside the fort and travel back in time to the first Spanish settlement in the Philippines. Still near Fort San Pedro and Sto. Niño Church is another Catholic church that you should not miss to visit while in Cebu City. The Cebu Metropolitan Cathedral, also called as The Metropolitan Cathedral of the Most Holy Name of Jesus and St. Vitalis, is the ecclesiastical seat of the Metropolitan Archdiocese of Cebu. The cathedral was first constructed in 1689, completed in 1909, and rebuilt in 1950 after it was almost destroyed during World War 2. 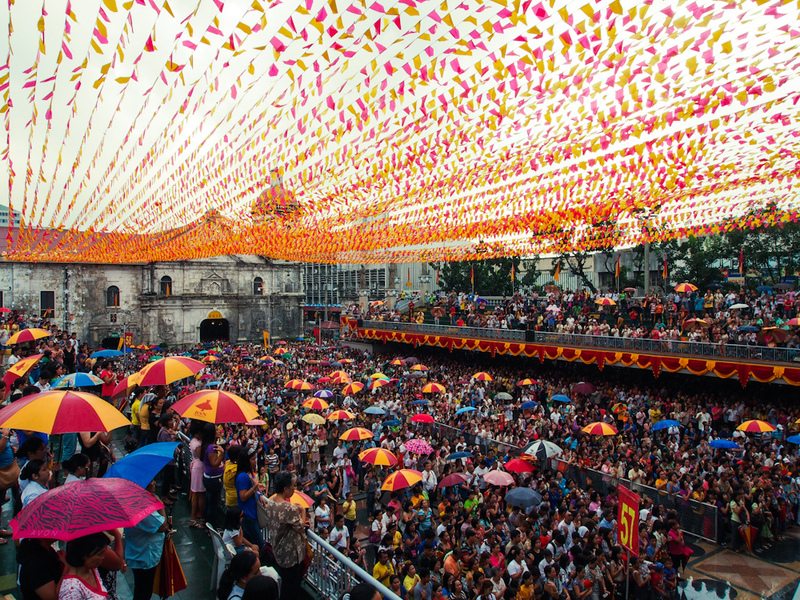 SINULOG – The major and most popular Cebu festival, the Sinulog festival takes place every third Sunday of January to celebrate Señor Santo Niño de Cebu (Sir Baby Jesus of Cebu). Also commonly known as Fiesta Señor, the fiesta features highlights that include a colorful and lively mardi gras parade after an opening solemn procession. PASKUHAN – A celebration during the December Yuletide season, the Paskuhan Festival is a Christmas event that boasts of festive song showcases and lantern-making. KADAUGAN SA MACTAN – Literally translated into “Victory in Mactan,” this one-day celebration on April 27 features a one-day re-enactment of the historic Battle of Mactan, when chieftain Lapulapu defeated the technologically advanced troops of Portuguese explorer Ferdinand Magellan. 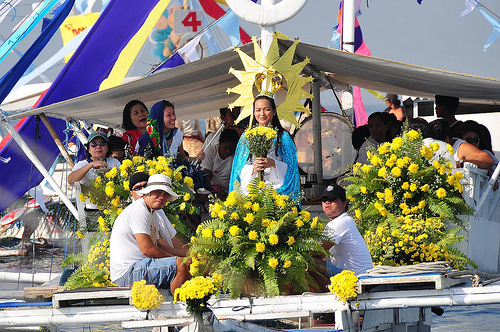 VIRGIN QUEEN OF THE RULE FIESTA – The Virgin of the Rule fiesta celebrates the Cebuanos’ deep religious faith. Held from November 20-21 in Opon town and Lapu-Lapu City, this social and religious event is a showcase of the best that Cebuanos have to offer, including food fair, a procession with all the pomp and circumstance expected of the Filipino, and a coronation of a Fiesta Queen. SEMANA SANTA SA BANTAYAN – Bantayan Island celebrates Holy Week with a series of solemn religious rites and local celebrations. On the second week of April, this normally quiet island near Cebu comes alive with tourists and inhabitants’ relatives and friends, who all arrive to enjoy the presentations they put on, the beautiful white sandy beaches and clear tropical waters. FIESTA SA CARCAR – The Cebuano town of Carcar is renowned for how brilliantly the Spanish architecture of its houses stand out against the quaint Cebuano countryside. On November 24 and 25, Carcar comes alive with a celebration in honor of its patron, St. Catherine of Alexandria. Popular local delicacies are cooked up in great amounts to supplement lively entertainment. SANAYON – The Sanayon is a festival held in several towns in the second district of Cebu about 100 km south from Cebu City. A month-long agro-tourist activity, the Sanayon is another attraction that brings tourists out to the beautiful Cebuano countryside. 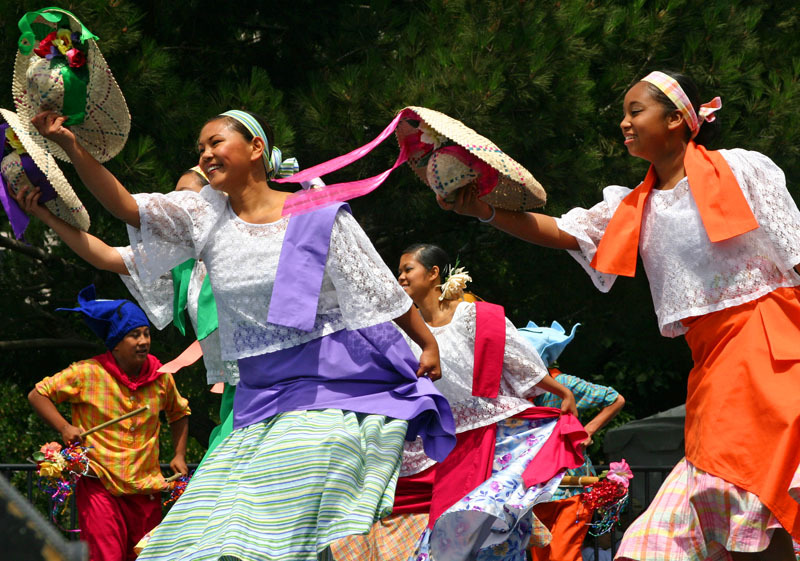 TRES DE ABRIL CELEBRATION – Cebu looks forward to this celebration every April 3 to remember the Cebu natives’ victory under the leadership of Leon Kilat over Spanish forces. This historic battle resulted in the illustrious distinction of Cebu towards being the first major island outside Luzon to oppose the Spaniards. 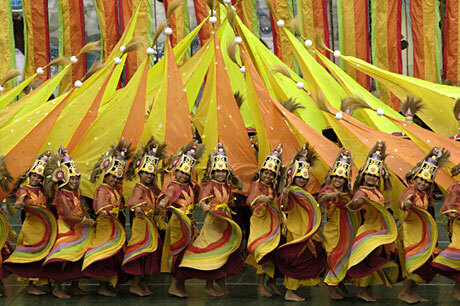 TAGBO FESTIVAL – To honor the patron of Patron Santo Niño de Poro, this festival is observed in the month of January. CHINESE MOON FESTIVAL – This festival starts from 2nd October and closes on 7th October and is observed with great pomp and vigor. 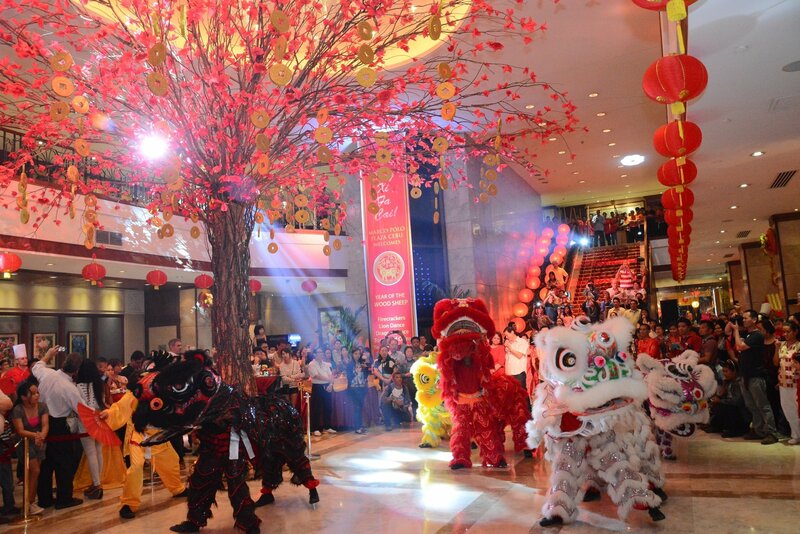 It features dragon dances, parades and a display of fireworks. DINAGAT FESTIVAL – The main traits of this festival is dance competition based on the rituals associated with fishing and street dancing. Lansiao is just an ordinary sumptuous soup dish braised from a slow-cooker. 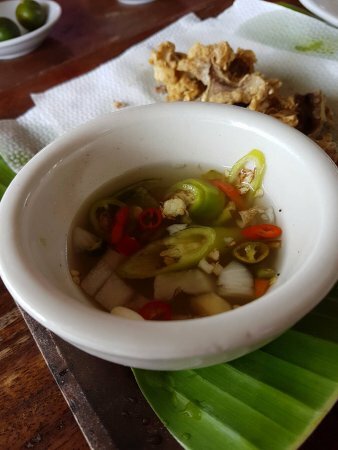 Rumored as an aphrodisiac, this exotic Filipino dish is made up of out-of-the-ordinary ingredients, such as the testicles as well as the reproductive organ of a male cow, bull, ram or horse. It is best paired with a plate full of mais, a roughly ground corn that serves as a healthier alternative to rice. 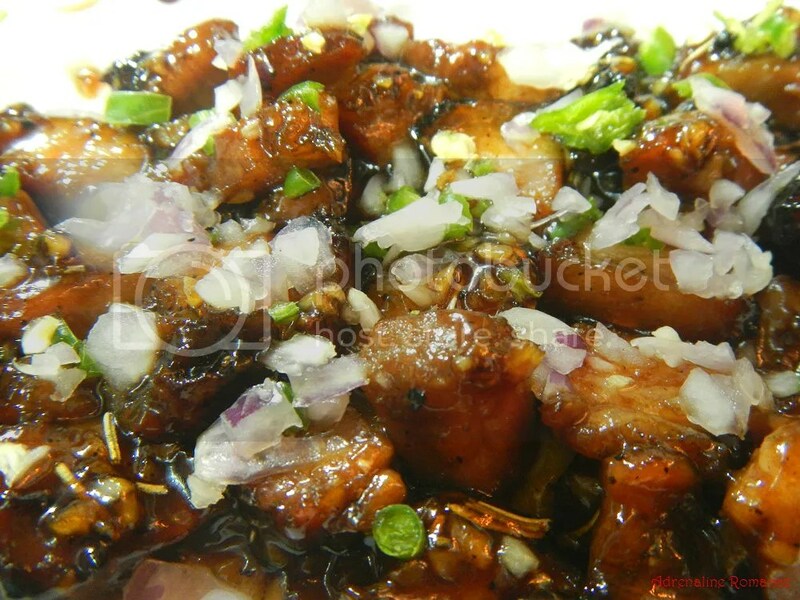 Ginabot is salty, crispy and tasty, ginabot, or also referred as chicharon bulaklak, is basically an exotic dish consisted of deep fried swine intestines, and served with a spicy and flavorful dipping sauce of red chili, onions and vinegar. Tuslob Buwa is one of the hottest food crazes to ever hit this buzzing metropolis as it is so popular that even Cebu’s wealthy socialites and professionals have gone crazy over this culinary treat. While this local delicacy has been in Cebu’s culinary scene since the early 2000s, it has been experiencing an impressive resurgence in the community. Sizzling pochero (“poh-cheh-roh”) is a humongous chunk of beef joint/shank with marrow taken from pochero, a common Philippine stew of meat and vegetables. Take away the veggies and the broth, douse the meat in gravy, place it on a hot sizzling plate, and you’ve got sizzling pochero. The flavor of the beef comes from stewing it for hours as pochero, with salt, peppercorns, and onion, until the meat is fall-off-the-bone tender; corn on the cob, shredded cabbage, and bamboo shoots are added just before it’s served. Some call it cholesterol on a platter but, the Cebuanos call it delicious. Sinugba or sugba (“soog-bah”) refers to nearly any food that’s cooked on a grill over charcoal (its Tagalog name is inihaw). It also represents the “su” in the term sutukil a handy summary for how Cebuanos traditionally cook: sugba (grilling), tuwa (simmering in broth), and kilaw (eating raw). 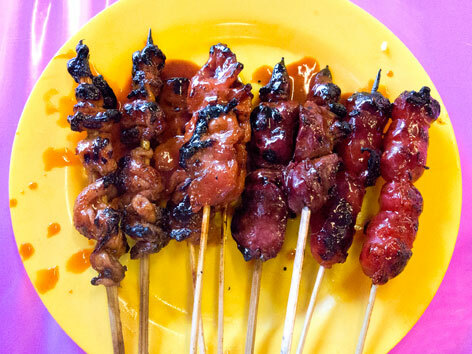 The most popular items are liempo (pork belly), paa (a quarter of a chicken, the thigh and leg), slices of pork on barbecue sticks, chicken or pig entrails, and fresh seafood such as whole fish or squid, usually stuffed with chopped green tomatoes and white onions. Pre-grill flavors are simple, relying on salt and not much else, although chicken and pork tend to be smothered in a sweet barbecue sauce after they’re grilled (you can request it on the side if you want). 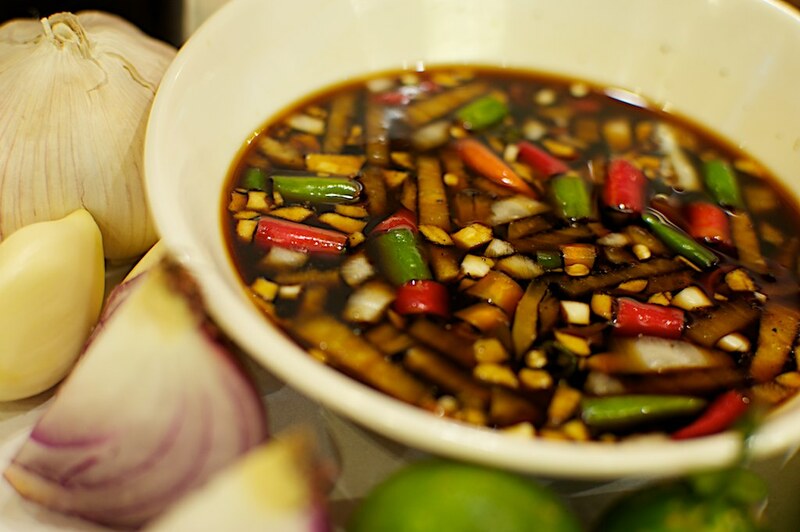 As is often the case around here, ingredients for your own soy sauce-and-vinegar sawsawan (“sahw-sah-wan,” dipping sauce) are usually made available. 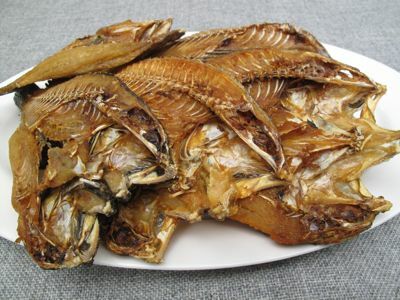 Danggit or Daing na Danggit refers to crispy, fried sun-dried Danggit, the Filipino word for Rabbitfish, Pinspotted spinefoot, Mottled spinefoot or Spinefoot. After frying it can served with Sawsawan (dip) made from slices of fresh tomatoes sometimes with chopped onions and other Sawasawan like Suka (Vinegar) with crushed garlic and Siling Labuyo (Bird’s eye chillis). Lechon is literally roasted pig. 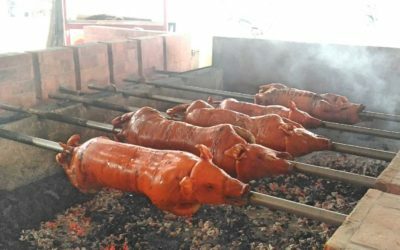 In the Philippines, it’s with a whole pig cooked on a large stick over a pit filled with charcoal. The pig is prepared in advance with seasoning placed inside the pig where the insides have been removed. Then the whole pig is cooked rotisserie style for 1.5 to 2 hours depending of the size of the pig. 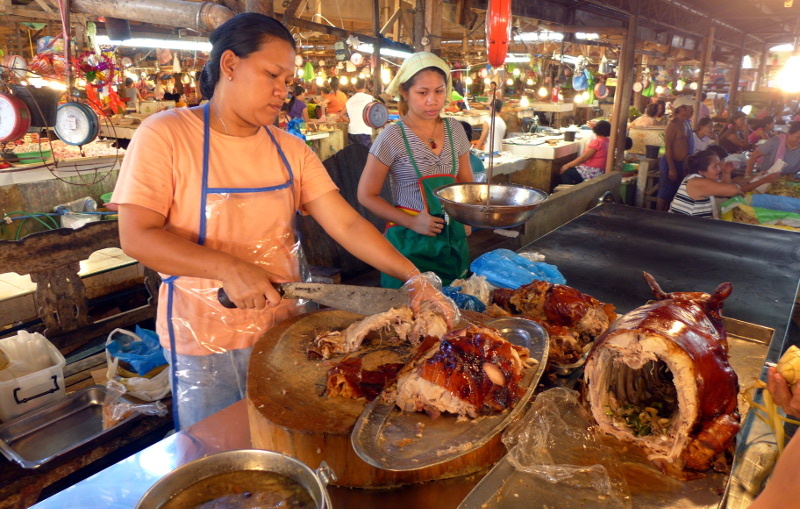 The best lechon is said to be made with young pigs, between two to six weeks old as they are less fatty. Cebu lechon is a traditional dish prepared for special events or fiestas such as holidays, parties and festivals. It is best enjoyed with the whole family as there is a lot of meat to be shared! NOTE: THESE HOTELS, PENSIONS AND INN, AND OTHER TYPES OF ACCOMMODATIONS, WERE RANDOMLY SELECTED AND THE AUTHOR RESERVES THE RIGHT TO CHOOSE FROM THE LONG LIST OF HOTELS, PENSIONS, INNS, OR ANY OTHER ACCOMMODATIONS, WITHOUT PREJUDICE TO THOSE THAT WERE NOT INCLUDED HEREIN.